Max Kennerly of the Pennsylvania-based Beasley Firm writes about school bus accidents in the context of the recent Chesterfield, New Jersey tragedy. 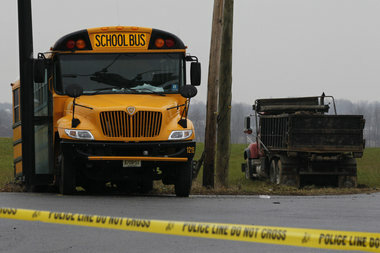 There, a dump truck slammed into a school bus, killing one child and injuring many. The dump truck had a flashing yellow light, and the school bus driver failed to stop for a stop sign. Part of the last issue, crashworthiness, has to do with seatbelts on buses. We discussed bus seatbelts in a prior post. This New Jersey bus apparently had seatbelts, as required by New Jersey law. However, it is unclear what kind of seatbelts the bus had (two-point or three-point). Did the seatbelts prevent injuries or cause them? These issues require serious consideration, and they crop up time and time again in auto accident cases. The other tragedy is that there is a time limit–because a governmental entity may be at fault, the victims must give proper notice to the state or city within 90 days of the accident. Nevermind that the state and city are obviously well aware of the accident. Failure to give proper notice within those 90 days (when families are trying to grieve for their loved ones, care for their injured, and move back to a place of normalcy) means that those families may be forever barred from recovering in a lawsuit.